﻿ Moto3: McPhee's future hanging in the balance? British Talent Team Honda rider John McPhee’s future in the Moto3 championship could well be hanging in the balance as rumours continue to circulate the MotoGP paddock about the future of the entire squad. With the 2017 podium finisher still to sign a contract with the squad (run by series organisers Dorna) despite only three rounds remaining of the current season, speculation has increased in recent weeks that the Spanish company’s plan is to scrap the project for next season, potentially leaving McPhee high and dry at the eleventh hour. Speaking to MCN after Sunday’s race, a Dorna spokesperson would only confirm that there are likely to be ‘significant’ changes announced for the future of the project in the coming weeks, but wouldn’t divulge further information into exactly what could be in store for either team or rider. 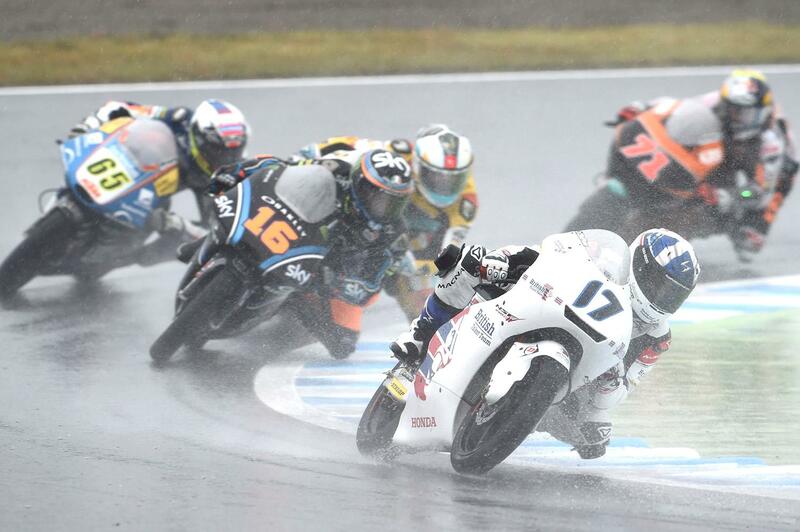 The news comes as a major blow to the Scottish racer after finally making a breakthrough with their Honda machine at Motegi, radically altering the machine’s suspension settings to allow McPhee to return to feeling comfortable in the wet conditions in which he won last year’s Czech Grand Prix. And even though his charge through the pack in Sunday’s race was halted by a combination of spray and steamed visor and screen limiting his visibility, he says the weekend – and a top ten finish - was as a whole a positive. "It was a crazy race to say the least! Being cut to 13 laps was a shame as I had to come from so far back but my pace was better today. 10th position was all I could manage but I was in the fight for sixth. I know I should normally be one of the fastest in these conditions but with no feeling from the bike it's been difficult this year in the rain. “I'm happy that we've had some consistently wet track time and working together with my team we've improved the feeling a lot and found the correct direction to go in. Now we're onto Phillip Island where I'm really keen to get back on track." Moto3: McPhee set for BT Sport Honda team? Moto3: McPhee in line for Petronas Honda?